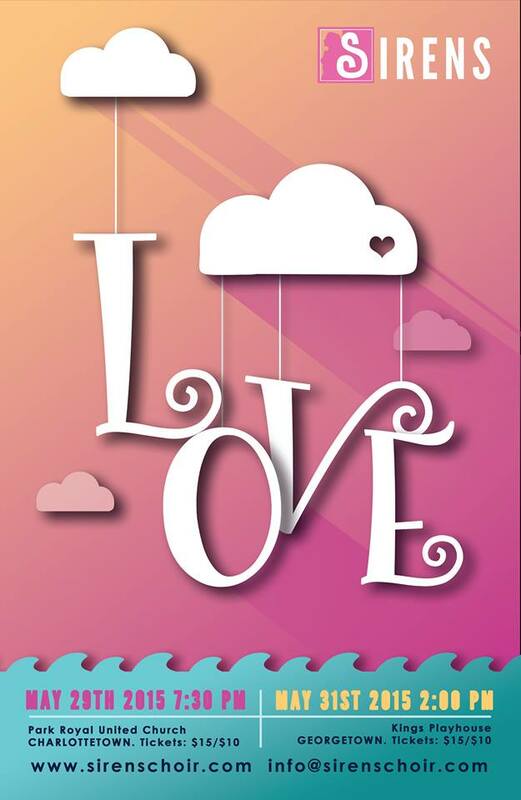 This May, Sirens will deliver two performances of its spring concert, L.O.V.E., on Friday, May 29th, 7:30pm at Park Royal United Church, Charlottetown and Sunday, May 31st, 2:00pm at Kings Playhouse, Georgetown. Join Sirens as they celebrate spring, the season of love, in song. L.O.V.E. will explore the emotion in its many forms, from the excitement of new love, to the comforts of mature love, and love of place. Between pieces, members of the group will share their favourite love stories with the audience. The performances will include a variety of songs for all musical tastes. Contemporary compositions will be featured alongside pop standards such as Mister Sandman and When I’m 64. Arrangements of folk songs Log Driver’s Waltz and Shenandoah parallel colourful madrigals. Violinist Sean Kemp will join Sirens for Eric Whitacre’s Five Hebrew Love Songs. Of course, the program will include an arrangement of Nat King Cole’s L.O.V.E. Admission is $15 for adults, and $10 for seniors and students; tickets will be available for purchase at the door of both venues.